Lars Behrenroth from Deeper Shades Recordings and Deeper Shades Of House is a deep house fan first and foremost. So when the chance comes to put together a package including artists he truly admires, all strings will be pulled! For this Deeper Shades Recordings release, Peter Oakden & Ricky Reid from "The True Rebels" created a bass heavy and dub influenced midtempo house tune. Label head Lars Behrenroth couldn't leave his fingers off it and remixed the track by raising the tempo while still keeping the integrity and core of the original. 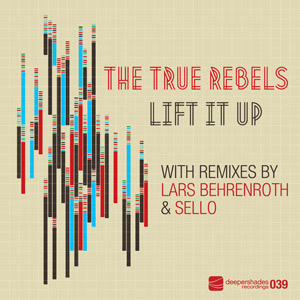 Another one of Lars' favorite artist's, Sello from Dusseldorf finally remixed "Lift It Up" and turned it into an organic brain twister, maintaining the tempo feel of the original. This release is truly by fans for fans! Christo "Another amazing release from Deeper Shades, loving all the tracks but The Lars Behrenroth remix is my favourite! Will be supporting!" Nacho Velasco "Great ep. I like Sello manages to create that atmosphere." Dr. Bob Jones "Deep, and moody, BUT very nice! All cuts worthy of air & club play. For the discerning players amongst us.....LOVE!" Eddy Ramich "I will play in club and radio .. do like the original"
Vinny Da Vinci "DSOH on the case once more!!!" Kiko Navarro "I like the slow house vibe on this track, perfect to build the dancefloor at good places like Garito Cafe in Mallorca. Will play it for sure." Distant People "this is pure class, slammin bass and such a bumpin groove, just sneaks up on you ! love it!" Simbad "Nice & deep shhhhh, fave is the Lars B remix ! Nice 1"
Mark Milz *Radio Corax, Germany* "I love the sello remix a lot !!!" Halo "Lars Behrenroth remix is HOTTTTTTTT"
Nick Holder "All the mixes are dope, gonna put this on high rotation"
Alan O'Malley *RTE Pulse* "Flawless package. 'Original' is the standout can't wait to airplay on the show!!" Sean Smith "Feeling the original mix the most. love the viibe! remixes are good but the original for me now." Charles Webster "Sello mix is really nice...will play 4 sure…thnx"
Osunlade "Love the lars remix!" Fish Go Deep "The Lars remix for me deep and pumping !" Souldynamic "Nice afro deep track! Lars Behrenroth Mix is so hotttt!!" Ralf Gum "Nice release. Sello remix is the one for me." Boddhi Satva "Lars always delivering musical greatness. The sounds are so beautifully treated it's an absolute pleasure to support this release." Minus 8 "nice and deep, can use it in my sets!" Mike Fossati "Quite simply an ingenious slice of deep house guaranteed to send shivers down your spine... not to forget to mention the stellar remixes…"
Hector Romero "Fantastic release - all mixes do it for me." Kanunu "Nyc Package once again - definite supporting"
Trickski "Superb package! all versions are great. my fave is the original and the LB remix though. thx!" Trancemicsoul "Really nice vibes! Will play the Lars Behrenroth Remix. Thanks!" Anna Wall "Love the slow groove of this amazing remix from Lars here too, has a hint of Innervisions vibe. Nice work all. I'll put it forward for the Future Disco radio show"
DJ AIS-T "Great release, these sound exactly the way I love to get down! Originals version is my favourite but Lars remix will be supported on dancefloors and with airplay on my show. THANK YOU DSOH"
Groove Assassin "Supa Hott Package ...great set of mixes !" Michael Reinboth "Good solid stuff, like the orig and Sello mix is good as well, worth a grab and play." Anton Zap "will play and support, thanks for sharing." Matt Pond "yes lars.. this is right up my street. like all mixes but the original is my favorite. looking forward to playing it out. thanks"
Andy Roberts "Doesn't get much deeper than this, favorite mixes are the Lars and Sello"
Jose Carretas "Lars Remix is very Dope!" Henri Kohn "very nice. original mix is my fav! danke!" Cory Centric "Fire after a sloe burn feeling this for sure"
Master Kev "Lars' remix is hot! also feeling the original quite a bit too"
Satoshi Fumi "love both of remixes.will play!" DJ Tipz "Great music, Lars Banging Remix !" Sebastian Davidson "Pure quality! Timeless underground house music! Thanks!" Eman "really Nice Lars...Full Support..."
Rancido "nice Release.. i'm enjoying the Lars Behrenroth Remix ..wow"
Funk Deepstar "Seroba one way, loving the Lars Behrenroth remix. Loving the energy in this one, can't wait to drop this on my sets." Roberto Rodriguez "Oh yes! Digging this. All mixes working for me!" Dairmount "Beautiful release. Feeling all versions here..."